6.24.2013. A death in the family sends one looking for photographs. When my Uncle Pat died, I dug out an envelope of photos from a 1978 Christmas party at my parents' house. There were several photos of Pat with his banjo, one of them decent, which also featured my dad (bottom thumbnail). There were also not-horrible shots of my uncles Jack, Bill, and Tom. They are all gone now, so it seemed appropriate to cluster them in a single image. 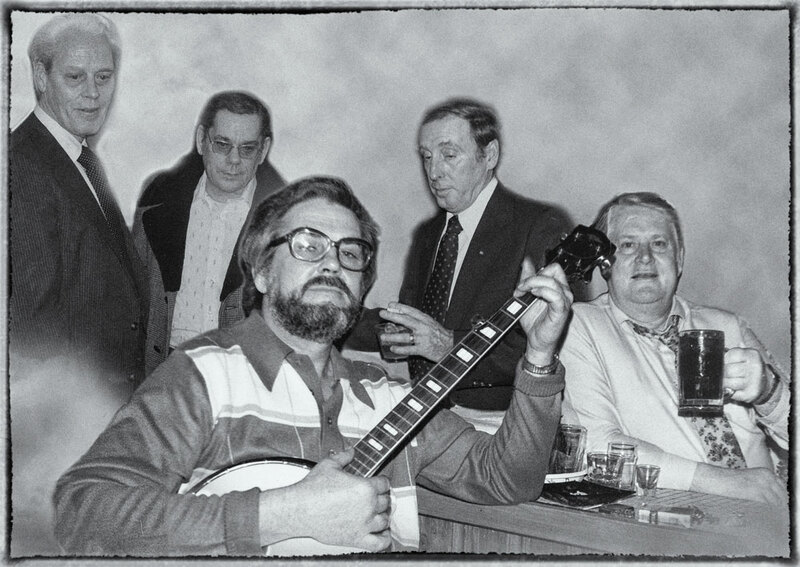 Enlarged the canvas of the best photo of Pat with his banjo and Dad toasting his cola. This is the base photo. Roughly selected the uncle images from two other shots and dragged them into my base photo. Used image masks on all three to black out unwanted elements. Used a soft brush... not perfect, but the whole thing is a little surreal, isn't it? The Tom layer needed color-balancing and levels adjustment layers to make it fit better with the others. Resized and moved around the elements till I was satisfied with the composition. Added a simple background with a gray layer and subtle Render > Clouds filter. Also threw in some real clouds, looking for a little better texture and maybe a hint of heaven. Patching and cloning: gave Pat an elbow by lifting it from another photo (top thumbnail) and contorting it into place. I can see now that it isn't quite right, but it supports the overall illusion. A gradient-map adjustment layer on the patch helped match the shirt color. I also did a little patching/cloning to expand the backside of Jack's suitcoat. Added a little cloudiness to the hole in the lower left by copying a real cloud from a landscape photo and inserting it in a layer between Pat and Jack. Used an auto-curve adjustment layer to brighten the composition. I decided that a final rendering in black and white would give the composition more gravitas and smooth over the rough edges. I tested the b&w using an adjustment layer. When it looked pretty good I did the final black and white rendering with the Silver Efex Pro filter. Here's a screenshot of the final set of layers. Don't think of this as a click-by-click tutorial, but as a guide to a general approach. There is kind of a heavenly Rat Pack quality to the result, don't you think?